Anyone who’s braved the weekend brunch rush at Aunt Mary’s Cafe (4307 Telegraph Ave.) can attest that the place isn’t exactly hurting for business. The Guy Fieri-approved restaurant has been packing in crowds since it opened in 2008 — back before Oakland’s big foodie boom had really hit that stretch of lower Temescal. Still, despite the restaurant’s successes, co-owner Jack Stewart is planning big changes. The Southern-inspired brunch spot relaunched dinner service this past weekend (having put it on hold for the past several years), and, thanks to a recently acquired liquor license, it has added beer and wine (and mimosas, naturally) to the menu as well. Perhaps most significantly, Aunt Mary’s is moving — albeit just down the street, to the former Clausen House Thrift Shop location at 4640 Telegraph Avenue, next door to the old Hooper’s Chocolates building. Why move now? Stewart cited several factors: The restaurant’s new home has a more prominent street presence and is located closer to the part of Temescal that gets the heaviest foot traffic. The rent is also less expensive, and even though the new space is roughly the same size (about 2,550 square feet) as the restaurant’s old digs, the layout is such that it will allow Stewart to put in a much larger walk-in fridge. Stewart said the current dinner offerings stay true to the restaurant’s overall focus on what he describes as “regional American comfort food, with an emphasis on the South.” Entrées include dishes like a meatloaf made with ground prunes that’s served with house-made plum ketchup, and a version of Country Captain — a Southern specialty rarely seen in these parts — which consists of chicken legs braised in a tomato-based curry sauce. The new location will require an extensive build-out, but Stewart said his contractor is confident that Aunt Mary’s 2.0 will be ready to open by sometime this summer. Aunt Mary’s will continue to operate in its current home until then. After that (restaurateurs, take note! 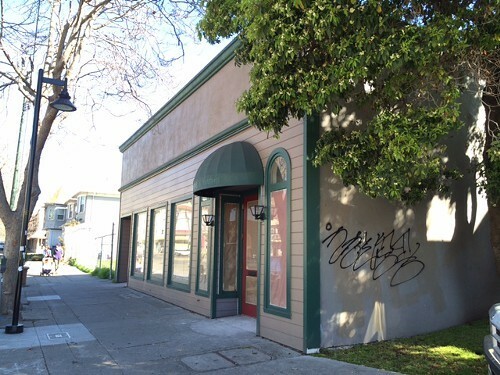 ), the lease on a fully equipped restaurant at 4307 Telegraph Avenue will be available for purchase.